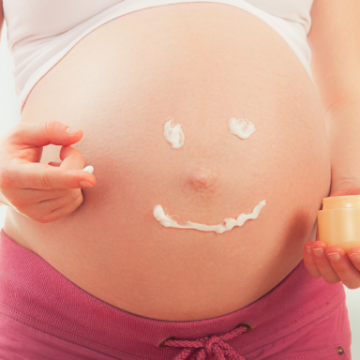 Once that pregnancy test comes back positive, start moisturizing the areas where stretch marks are most likely to develop—your belly, lower back, breasts, and hips. Stretch marks occur when the fibers just underneath the skin's surface break apart due to the pressure of rapid weight gain. Moisturizer helps maintain skin's elasticity, making it less likely to tear when your body starts expanding, says Debra Jaliman, M.D., a dermatologist in New York City. In the morning, slather on a rich cream that provides lasting hydration. Boppy Bloom Stretch Mark Cream ($13; babiesrus.com) contains coconut oil, shea butter, and vitamin E. At night, add a few drops of a skin-nourishing oil like Bio-Oil ($28 for 6.7 oz; target .com) to a warm bath so you can moisturize without lifting a finger. Another way to defend your skin: Aim to gain weight slowly and steadily without putting on more than your doctor recommends. If despite your best efforts you start seeing red (lines, that is), take comfort in knowing you're not alone: Stretch marks develop in nine out of ten pregnancies, usually in the sixth or seventh month. You have the best chance of reducing their appearance when they're new, says Dr. Jaliman. Once scars fade to white, they're extremely difficult to treat. Mederma Stretch Marks Therapy ($26; amazon.com) is safe to use starting in the second trimester, and has been shown in clinical studies to significantly minimize scarring. Just keep in mind that you have to be diligent about applying it daily, and it may take up to a month to see an improvement. While you wait, camouflage the red with a product like Dermablend Leg and Body Cover SPF 15 ($31; dermstore.com). It won't rub off on your clothes. Scars are more noticeable on soft skin, so now's the time to incorporate a firming serum into your routine. We like Mustela Maternity Body Firming Gel ($39; mustelausa.com), which is safe to use while breastfeeding and contains a naturally derived ingredient called centella asiatica, which offers a skin-tightening effect. If topical treatments aren't doing the trick to improve your stretch marks, scheduling a series of pulsed dye laser treatments is a safe option even while you're nursing. But it'll cost you: A single treatment can range anywhere from $350 to $1,000, depending on where you live. Remember, there's always another option: Embrace them! After all, stretch marks show up in places most people don't see—unless you spend a lot of your time in a bikini!